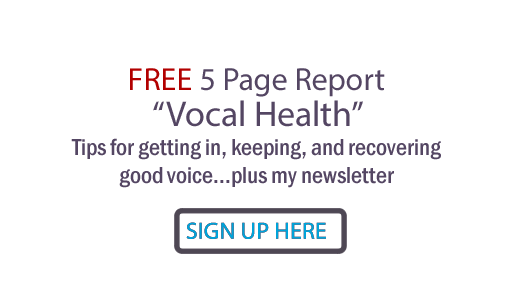 OK, I'm going back to my novice training in golf (bless my poor husband) to bring out yet another golf/vocal parallel: There is an important difference between vocal exercises and performance. A singer must make this distinction clear to turn a performance into a heart-moving event. They nurture the vocal musculature, strengthening it, warming the instrument with increased blood flow and enabling greater flexibility. With the flexible and strong instrument at your disposal, and with muscle memory causing an automatic connection to take place between your mind/body/vocal apparatus, you're then and only then ready for a great vocal performance. Don't think about technique like you do when you are trying to learn a vocal exercise correctly. The time for that is BEFORE you perform. Do your vocal training exercises regularly so it's just what you do naturally when you perform. Learn how to connect with the audience through the song. That should trigger all the right reflexes, if you've trained your muscle memory correctly. Don't worry about being perfect!! I've found that if you just commit to communication (after you've trained your instincts), you can do things in performance even better than in a mechanical vocal exercise. Bottom line... you have to do both: Exercise and Perform. Just keep them separate in your mind. Voice teacher Jeffrey Allen says the Italians used to suggest taking your technique onstage with you in your little finger". Meaning... that's how much awareness they gave to training when actually performing. It's a paradox that you must also practice performing... make it a regular habit to sing to someone (even a cat or dog will do). Trust your trained voice and it will reward you with performance magic! This is a great tip. As an actress, I've learned to do any work on my character before the performance, but then I tend to get the best results if I just let all that go into my subconscious during the actual performance and kind of go by instinct. I've never thought about this principle applying to singing, though. It makes total sense. Thanks! Yes, that's a great way to put it. There are a lot more techniques for acting that have parallels in singing. Here's another- I bet you would agree that it's important to respond to your acting partner in a scene dialog. Singing is also most authentic when you are communicating TO someone. Even if it's to your own heart. Thanks much for responding, Leigh Ann!